From my point of view, the extreme controller web interface should be changed/redesigned so that today’s screen resolutions can be used in a better way. I have a 4k display and the usable rectangle is very small (despite that there is a huge white space). Especially the AP list does not fit onto the screen (someone has to scroll). I found out that the width is hard coded to about 600px but today every screen has at least 1024x768 screen resolution. A simple change width the Firefox Debugger (615px to 1015px) makes everything bigger but this is not permanent (a page reload resets everything). 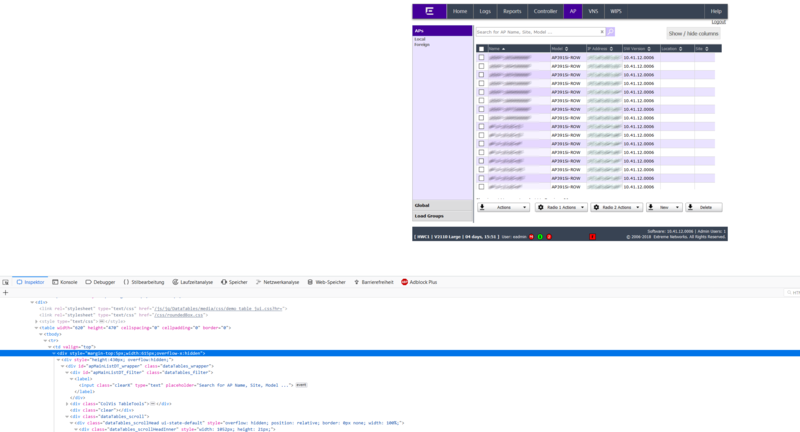 The best thing would be that this web interface would dynamically resize to the screen resolution of the displaying computer (redesign of the whole web interface) but the easier way would be to change all the hard coded values from 6xx to 10xx. Could you please consider that for the next firmware version? I like the concept, if you use Firefox a workaround would be to put this CSS override to a Stylish plugin so every time you load the page it should keep that width setting. Does using page zoom help with this? That's usually persistent, at least in Firefox. Edit: nevermind- I see what you mean in the screenshots. I'll mark this as something to send over to engineering. Zoom does not work (is not a work around because the table gets resized as well). Have you considered changing something within the firmware so that this website works better with today’s screen resolutions?